Butterflies are delicately winged, colorful pollinators that keep gardens growing throughout the country. No matter what region of the U.S. you visit or live in, you are sure to see a wealth of different butterflies common to that area. Common Butterflies Found in Areas of the U.S. 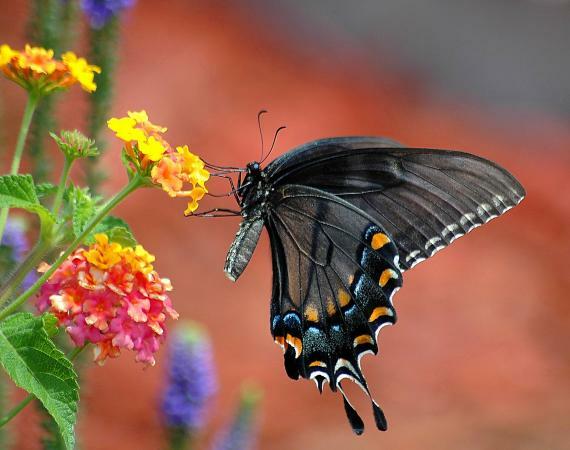 The United States is home to about 750 types of butterflies. They belong to the insect family Lepidoptera, which means they have scales covering their wings. Depending on the type, the fact is most butterflies only live for a couple of weeks, however, some types can live for over a year. Butterflies experience metamorphosis and go through four life cycle stages, which are egg, larvae, pupa and adult. Butterflies are the adult stage of this life cycle. No matter where you travel throughout the U.S., you are bound to notice butterfly species that you don't see in your home locale. However, you might recognize some visiting your area during their migration trek and as well as some species that are common throughout all regions of the country. Due to the cold winters in most locations of the Northeast, many types of butterflies will either spend the season hibernating or migrating to a warmer location. During warmer seasons, the area is host to a large selection of butterflies. Canadian Tiger Swallowtail: It is commonly found from Pennsylvania to Maine. Large butterfly with black and yellow markings. Hose plants include birch and aspen trees. American Copper: This butterfly resides in Virginia, going north to Maine. The mid-sized butterfly has copper-colored wings with black markings. Host plants include curly dock and regular dock as well as sheep sorrel. Holly Azure: This small butterfly's range is New Jersey south through South Carolina. Males are light blue and females are blue with black spots, with undersides of wings gray. As their name implies, host plants are those in the holly family. Common Buckeye: The buckeye resides in North Carolina north through Maine. It's a mid-sized butterfly with dark wings having copper, white and blue markings and with the distinctive circles lined in white. Host plants include various plantains and vervains. As with other regions of the country, many species of butterflies call the Southeast home. In locations that are warm during winter, you can see butterflies year-round. Eastern Tiger Swallowtail: This swallowtail is common from Florida to Pennsylvania. It's a large butterfly with yellow and black markings, with females being primarily black or yellow and males with yellow markings. Host plants include tulip trees, magnolia and ash. Orange Sulphur: The small, yellow butterfly commonly inhabits areas of Florida north to Delaware. Host plants include a variety of legumes, clover and alfalfa. 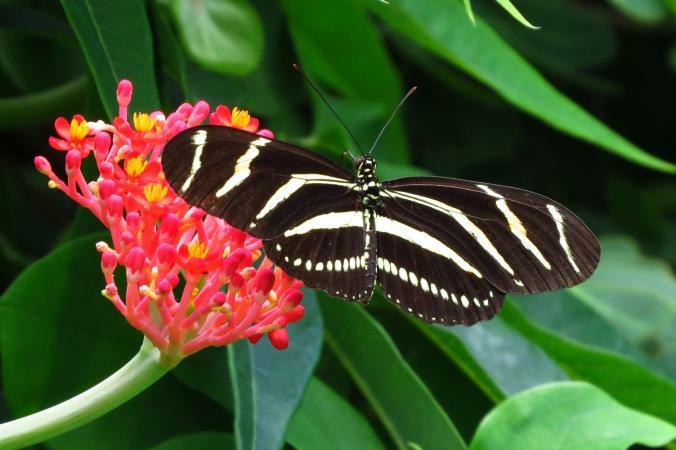 Zebra Longwing: It is commonly found in Florida to North Carolina. The butterfly has long, black wings with thin, yellow stripes. Primary host plants are zinnia and lantana. Queen: A large butterfly with copper colored with black markings and white spots along the outer wings and common from Florida to Virginia. Host plants include goldenrod and milkweed. The Midwest region is home to many butterfly species that visit gardens year-round in warmer locations. 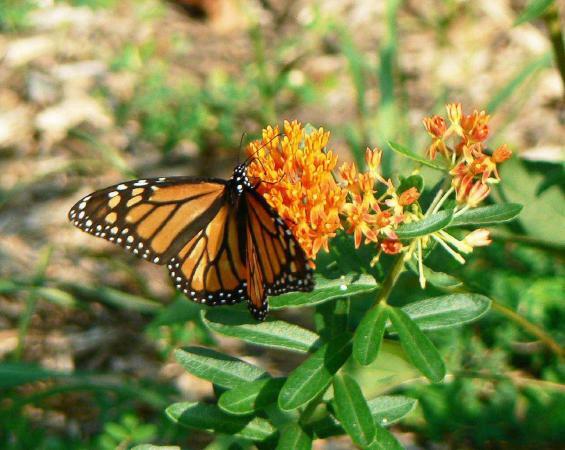 Monarch: This large butterfly is common throughout all areas of the Midwest, as well as the entire country. Its coloration is copper-orange wings with black and white markings. Its preferred host plant is milkweed. Upper wings are black, with the lower wings black and blue with white markings. Host plants include dill, parsley, spicebush and coriander. Great Spangled Fritillary: This butterfly is common through the High Plains region and Midwest. 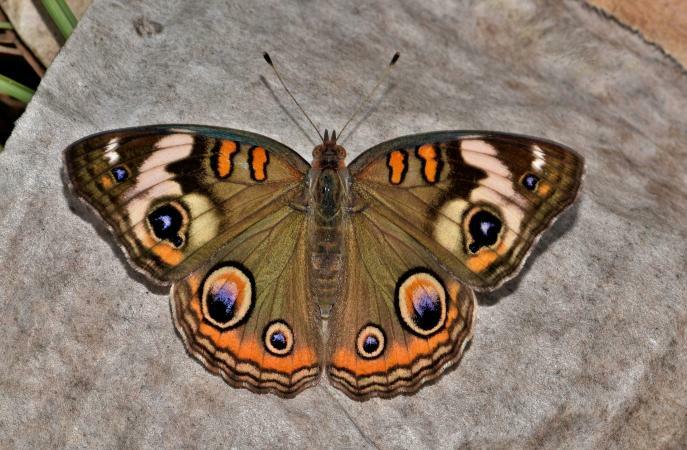 This medium-sized butterfly has yellowish-orange wings with black markings. The preferred host plant is violets. Spicebush Swallowtail: Though also residing in eastern portions of the country, this large and elegant winged butterfly is common through the Midwest. Its preferred host plant is spicebush. Checkered White: Found throughout the Midwest, this smallish butterfly has white wings with dark, blocky markings. Host plants include cabbage, mustard, beeplant, and turnips. As with warmer areas of the Midwest and Southeast in winter, warmer locations of the West can also see butterfly activity year-round. Pacific Orangetip: Common from Alaska south through California, this medium-sized butterfly has white upper wings with black and a reddish spot on the tips. The undersides of the wings are marbled in dark green. Host plants are those in the mustard family. California Sister: The butterfly resides throughout California, northern Nevada, and southern Oregon. It is a large butterfly with brownish-black wings and a white strip leading to orange tipped wings. Host plants include various oaks. 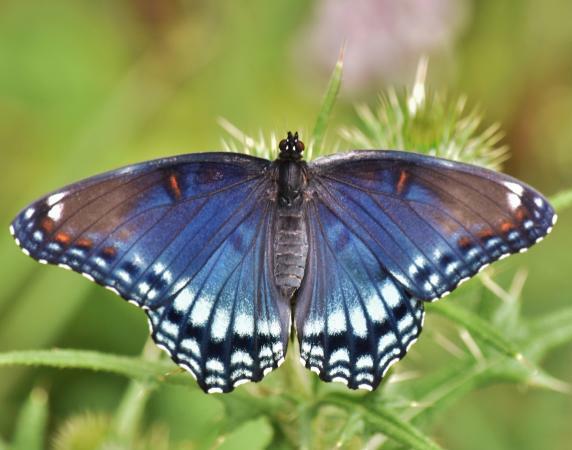 Red-Spotted Purple: This large butterfly resides north of the Rocky Mountains into Alaska, with populations found in Arizona and New Mexico. Its greenish-blue coloration is iridescent, with a distinct orange bar on the forewing and rows of reddish-orange dots on the upper wings. Host plants include poplar, birch, wild cherry trees, and willows. Blue Copper: The Blue Copper is commonly found from Washington through California and northern New Mexico and Arizona. The small butterfly has blue wings, with males brighter than females and having small dark spots on the outer wings. Host plants include those in the buckwheat family. At nighttime and during times of bad weather, butterflies spend their time perched on the underside of leaves, between blades of grass and even crawl inside the crevice of a rock. During the daytime hours, you may see butterflies basking on a leaf in the sun with their wings outstretched. Since they are cold-blooded and don't produce enough heat on their own, they are absorbing the sun's heat, which gives them the energy needed to fly. They also flutter from flower to flower, eating or sipping nectar. You might even see butterflies sitting on top of a muddy puddle where they are taking in the salts; this is especially true for males of the species. Many species of butterflies cannot tolerate harsh winters and migrate into warmer southern regions, migrating back to their range when temperatures warm. However, some butterflies tolerate harsh winter temperatures and most spend the season as caterpillars, with others spending the time in the pupa stage. A few butterflies spend cold winters as adults hibernating in a protected shelter such as a crevice inside a tree. The next time you're outdoors and gaze upon a butterfly fluttering around, don't let appearances fool you. These graceful performers are one of the insect world's hardest working pollinators and worth getting to know.